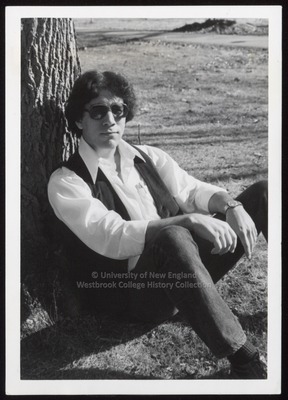 "George Paolini, Westbrook College, Class of 1979"
Westbrook College student George Paolini, Class of 1979, was a Fine Arts major and a day student. For his senior class candid photo, which appeared in the 1979 Tower Yearbook, he wore jeans with a white shirt, vest and sunglasses. His curly hair was parted in the middle and reached to just below his ears. George sits on the ground and leans his back against a tree on the Campus Green.